Reaction of a Jet | THERMO Spoken Here! ♦ To understand this event requires careful identification of the system, the fact of prevailing atmospheric pressure can cause confusion. The steady event is a flow of water that has its direction changed by a fixed blade. To keep things clear we use two steps to construct the system. The first step is to visualize the space the water passes through but without any moving water in that space. Think of it as "before the water jet is turned on." This tube-shaped space contacts the blade that water will pass through once it flows. This elbow-shaped tubular volume, our system "before the water flows," is drawn to the right. 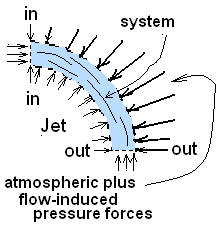 The sketch shows small pressure-forces that act on the system boundary as a consequence of the surrounding atmospheric pressure. The integral of this distribution of pressure-forces over the surface equals zero - the space is in equilibrium. Next we imagine the water to flow. Planes for flow into the space of our system, in, and out of it, out, are notated. The atmospheric pressure distribution remains but the pressure-forces on the outside of the bend become greater than atmospheric. They must increase because that distribution of forces causes the momentum of the flowing water to redirect, to be changed. The effect of the water might be said to create and "over-pressure" on the "outside bend" of the system. Mass equation: The information of this equation is simply that the speed at the entrance vin equals that at the exit, vout. to calculate. We assume this to equal zero. Resistance of the block to movement is represented as a distributed force applied over the outer boundary of the flowing water. This is a distribution of pressure, p, which acts perpendicular to the system surface. Also at that point is a shear stress (or friction per unit area) τ, which acts tangent to the surface, directed opposite to direction of flow. We ignore friction for now, removed from the equation by "X" in Eqn (1). In the next equation we express the integral of pressure over surface of the system any point on the system surface as being caused by atmosphere (see the figure above) or the blade. 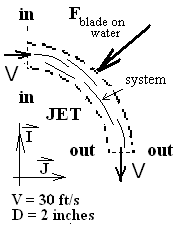 The entering and exiting flows are free jets. Consequently the pressures across the entrance plane and exit plane are atmospheric. 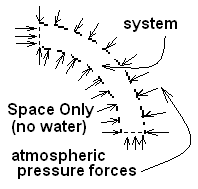 The contributions of atmospheric pressure-force over the entire system surface sum to zero. What remains is the distributed force of the blade against the liquid flow. sums to zero over the system surface. Since the details of the pressure distribution cannot be determined, the integral above right cannot be integrated. However, we can bypass that integration. Knowing it will yield a force, we represent the distributed pressure-forces as a single force which is called the reaction of the jet. A reaction is a force at the system boundary caused by the surroundings which effects the equilibrium of a system upon isolation. The reaction is a force on the water. Our system now looks as shown to the right. of the blade represented as a single force. One more small step is generally applied. The entering and leaving mass rates are equal. 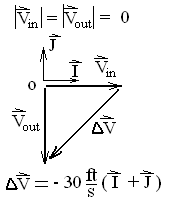 Hence the equation can be rewritten to cast the velocities as a velocity change, as ΔV. (5) Mass rate equals the density-area-speed product. Now enter the other numbers and apply the mass-to-force conversion factor. order; nothing has been moved left or right of the equality. water. This is the same idea in statics. Much of the difficulty in applying the momentum equation arises with system selection. It is advised to select the system to be the moving fluid. Do not include the steel of a blade or any matter other than the fluid. Thus one solves for the forces supplied by surroundings that cause the system momentum changes - this is called the reaction. Above we determined the force; an angular-momentum analysis is required to determine its location. Also it is wise to avoid senseless algebra and the "changes-of-sign" that happen. Above the stream of water is bent downward and backward. We expect the force required to have negative I andK components, which our solution confirms. Force of Water on Blade: A common next step is to determine the force of the jet of water on the blade. Our system analysis provided the force of the blade on the water, therefore the negative of this force equals the force of the water on the blade. So the water seeks to push the blade "up" and "away." So the water seeks to push the blade "up" and "away." The approach of having the system being the moving fluid only is the best way for beginners. Friction occurs, our answer is approximate.